As Vikram carried Betal, Betal started telling him another story. Once Virsen the king's guard, saw a woman crying. He asked her the reason, and she replied, "I am the goddess who protects the king. A demon has defeated me, so I will not be able to protect the king anymore. His life can be saved if you sacrifice your son to Kali ." Virsen told this to his son who was ready to be sacrificed, so Virsen cut his head in front of Goddess Kali's idol. Virsen's wife was so heartbroken that she killed herself. Virsen was left all alone so he killed himself too. When the king heard about this, he felt guilty and killed himself . 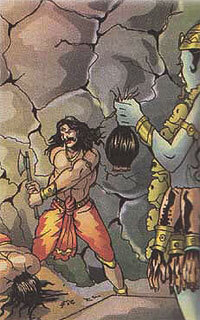 Betal asked Vikram, "Whose sacrifice was the greatest?" Vikram replied, "The king's. The son died because it was his duty, Virsen and his wife died because they lost their son, the king however had no reason to die." Betal heard this and flew away.